The Anaphylaxis Campaign is the only UK charity to specifically focus on people at risk from a severe allergic reaction (anaphylaxis) by providing information and support relating to foods and other triggers such as latex, drugs and insect stings. UK allergy charity helping patients by providing a dedicated helpline which is staffed by a team of fully trained allergy advisors. It provides support and information for sufferers of allergy, intolerance and sensitivities, as well as information on manufactured products and services. The BSACI is the national professional and academic society representing the speciality of allergy at all levels. Its aim is to improve the management of allergies and related diseases of the immune system in the United Kingdom, through education, training and research. The World Allergy Organization (WAO) is an international umbrella organization whose members consist of 97 regional and national allergy & clinical immunology societies from around the world. The American Academy of Allergy, Asthma & Immunology (AAAAI) is a professional organisation with over 7,000 members in the United States, Canada and 72 other countries. 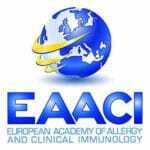 The European Academy of Allergy, Asthma and Clinical Immunology (EAACI) is an association including over 50 national European allergy societies, with more than 9,500 academics, research investigators and clinicians, from 121 different countries.